Come experience the beautiful central coast of California! We love the Central Coast! Emerson Treehouse is down a little dirt road nestled in the forest with a mountain view. Relax while you birdwatch, drink wine, or star gaze from either deck or go for a hike, beach walk, sightseeing, or shopping. So much to do...so little time! This is our second stay in the Tree House...we obviously loved it the time before as well! This sweet home is comfortable, clean and makes us feel like we are home away from home when we stay! In fact we are always sad upon 's in a quiet neighborhood, cozy but easy access to all the streets that bring us back into our beloved town of Cambria! Just one suggestion would be to supply more paper towels and tp for those of us that have a longer stay...(we were there 10 days) Can't wait to return again...:)Thank you for making us feel at home! 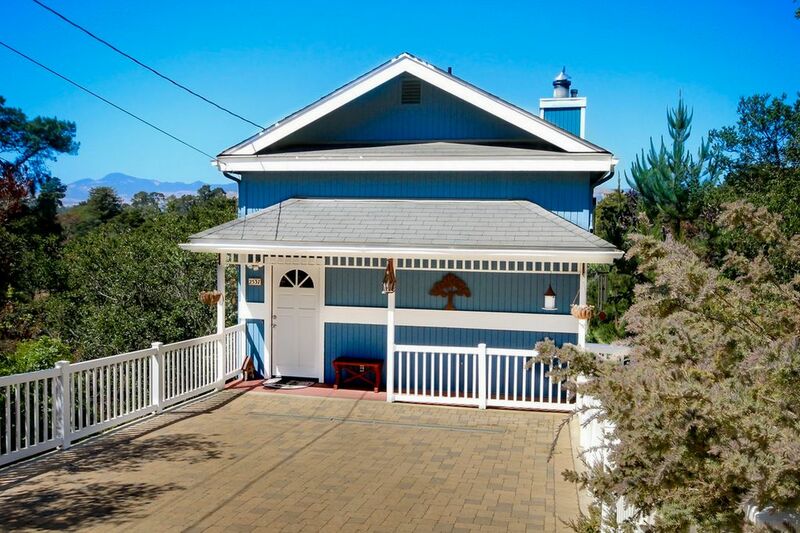 This charming little property is nestled in a forest community not too far (5 min)from some beautiful coastal access views.The home is just as pictured and very clean with all things needed for comfort and convenience. I'm a neat freak and everything was clean and organized in a manner that made was easy to find and use. The home has two levels with both bedrooms plus a bathroom being downstairs. It has some beautiful views of the tree tops and wildlife (saw deer every day at dusk and dawn.) It felt very safe with some nice friendly neighbors; not too close. This rental is very close to everything in Cambria,5 minutes from downtown Cambria, close to some bluffs, Moonstone beach (10 min), lighthouse (15 min),San Simeon area (25min) and even Big Sur (30-45 min.) II'd recommend and return. The Tree House is a wondrous experience of treetop privacy. The house is well equipped for cooking, sleeping and relaxing. We hope to return. At first the 4-day minimum stay gave me pause, but I'm so happy we stayed at the Emerson Tree House. While it is not 'steps' away from the coast, my wife and daughter enjoyed the quiet serenity of the forest. Trails are a 5 minute walk away, and it's so close to everything else by automobile. The description of the property was totally accurate and the kitchen and living area are spacious and welcoming. I found that we didn't watch much television this trip because we enjoyed our surroundings so much. One last positive aspect that was missing was the sound of street traffic -- this is not a busy street at all (and your car may accumulate some dirt). We loved this place! Would come back. It was very clean, well stocked with kitchen implements, condiments, tea, coffee, and tissues—important to someone with allergies. It was close to great hiking, restaurants, Hearst castle. It was nice to sit on the deck and watch birds. One small thing—when on the deck could hear the cars on the main route—not a big deal to us. We had a lovely time staying in the Emerson Tree House. Very well equipped, in a great location. Perfect for a family! Wine tasting off Hwy 46, Elephant Seal viewing, Hearst Castle tours, Piedras Blancas Lighthouse tour, numerous Cambria hiking trails, nearby cities such as San Simeon, Harmony, Cayucos, Morro Bay, San Luis Obispo and the most spectacular scenic ride up north...Big Sur!